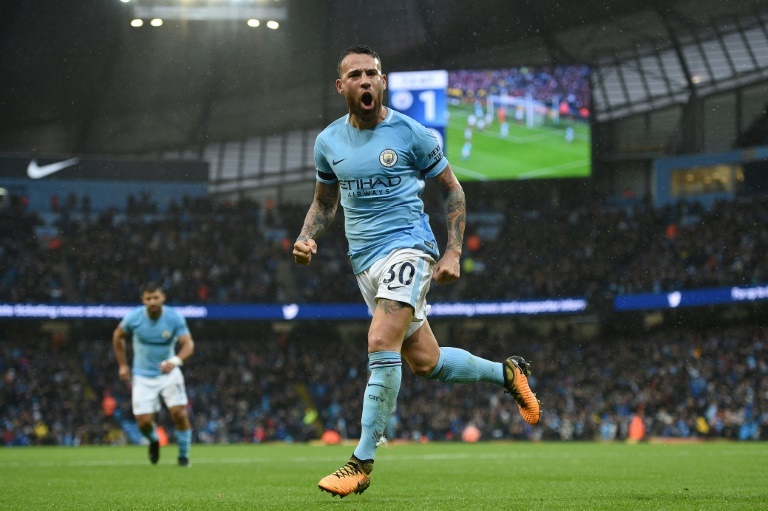 Manchester City defender Nicolas Otamendi celebrates scoring his team's second goal during their match against Burnley at the Etihad Stadium in Manchester, north west England, on October 21, 2017. LONDON - Manchester United fell to a shock 2-1 defeat at promoted Huddersfield Town on Saturday as Pep Guardiola's free-scoring Manchester City moved five points clear at the Premier League summit. Aaron Mooy and Laurent Depoitre scored at the John Smith's Stadium to give Huddersfield a first win over United since 1952 and condemn Jose Mourinho's side to their first loss of the campaign. City took full advantage by beating Burnley 3-0, with Sergio Aguero equalling Eric Brook's all-time club scoring record of 177 goals. Defending champions Chelsea closed to within four points of second-place United by beating Watford 4-2 while Tottenham Hotspur can draw level with Mourinho's men if they beat Liverpool on Sunday. United's defeat in rain-lashed Huddersfield followed their 0-0 draw at Liverpool last weekend and a laboured 1-0 victory away to Benfica in the Champions League in mid-week. Things started to go wrong in the 23rd minute when Phil Jones was forced off by an apparent hip injury, with Victor Lindelof taking his place. Huddersfield went ahead five minutes later when former City player Mooy robbed Juan Mata and followed in to score after David de Gea had saved from Tom Ince. Lindelof was at fault as Depoitre scored in the 33rd minute, failing to cut out goalkeeper Jonas Lossl's kick, which allowed Depoitre to round De Gea and score. United substitute Marcus Rashford headed in Romelu Lukaku's cross with 12 minutes remaining, but Huddersfield held firm for a famous win. Guardiola's City have won their last seven league games, scoring 20 goals in their last four home games. Argentina striker Aguero netted from the spot on the half hour after Burnley goalkeeper Nick Pope was contentiously adjudged to have fouled Bernardo Silva. Second-half goals from Nicolas Otamendi and Leroy Sane completed victory. Michy Batshuayi came off the bench to inspire Chelsea to a 4-2 home win over Watford that lifted some of the pressure on manager Antonio Conte. Beaten in their two previous league games, Chelsea took an 12th-minute lead when Pedro curled a magnificent effort into the top-left corner. Goals either side of the interval from Abdoulaye Doucoure and Roberto Pereyra put Marco Silva's hard-working visitors in front. But Batshuayi headed in a 71st-minute equaliser from Pedro's cross and after Cesar Azpilicueta put Chelsea in front late on, Batshuayi completed victory in stoppage time. "The performance was a good performance because to concede the equaliser at the end of the first and then go down in the first part of the second half, our confidence in that moment was low," said Conte. "But my players showed me that we have the attitude to fight and change the situation and get a different result. It was very important." Leicester City began life after Craig Shakespeare with a 2-1 win at Swansea City. Caretaker manager Michael Appleton saw Leicester go 2-0 up through a Federico Fernandez own goal and a Shinji Okazaki effort before Alfie Mawson replied for Swansea. Junior Stanislas teed up Andrew Surman and scored a penalty to give Bournemouth a 2-1 victory at Stoke City, who reduced the deficit through Mame Biram Diouf. Mikel Merino's late header earned Newcastle United a 1-0 home win over bottom club Crystal Palace, who stunned Chelsea 2-1 last weekend. Southampton host West Bromwich Albion in the late game. Manchester United fell to a shock 2-1 defeat at promoted Huddersfield Town on Saturday as Pep Guardiola's free-scoring Manchester City moved five points clear at the Premier League summit. Aaron Mooy and Laurent Depoitre scored at the John Smith's Stadium to give Huddersfield a first win over United since 1952 and condemn Jose Mourinho's side to their first loss of the campaign.